At FanGraphs, Carson helpfully pointed out 1) that the Caribbean Series begins on Thursday, and 2) you can watch the whole thing on ESPN3. Yes, live professional baseball, streaming right to your computer, at this time of year. WOOOOOOO! A few Royals have been playing in the Caribbean Winter League, and will presumably be a part of the Series. Mijares, one of the newest Royals, has had a nice winter. He has struck out 12 batters and walkedzero in 10 innings of work for the Tigres de Aragua. Sadly, Pena’s winter performance has not done much to solidify his spot on the Royals’ catching carousel, but on the other hand…it’s the winter. .200/.235/.293 is an ugly line, but who knows how much stock GMDM will put into that, especially given that Pena was sharing playing time with eight other catchers this winter. 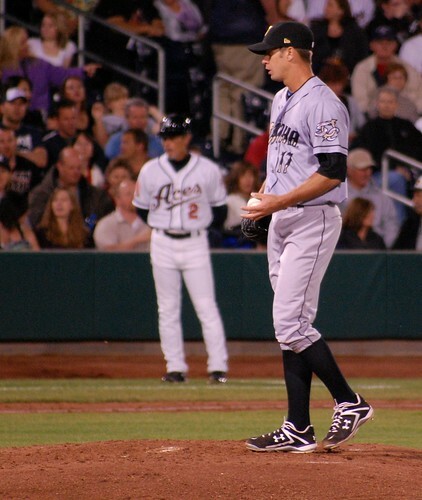 Teaford pitching at Reno, where I randomly happened to be once. Firstly, I recommend following Teaford on Twitter. He’s pretty entertaining, despite his self-description as the “Most Uninteresting Man In Baseball.” Back to the topic at hand, Teaford’s been a strikeout machine this winter, racking up 29 Ks in 23.2 innings. Oh, and he only walked three. NICE. Falu’s stats page is kind of screwy right now and not showing his winter stats for Mayaguez, but according to Facebook he did, in fact, play. So! There’s some local interest in the Caribbean Series, but really, we don’t need an excuse to watch baseball games, do we? It’s February! Just tune in and enjoy!